A risk factor is something that increases your chance of getting a disease, condition, or injury. The doctor will ask about your symptoms and how you injured your toe. The doctor will examine your toe to assess the stability of the joint and the severity of the injury. Toe sprains are graded according to ligament damage. In addition, the more ligaments damaged the more severe the injury. Rest — Avoid using the injured toe. Ice — Apply ice or a cold pack to your toe for 15 to 20 minutes, four times a day for 2 to 3 days or until the pain goes away. Wrap the ice or cold pack in a towel. Do not apply the ice directly to your skin. Compression — If the injured toe is the big toe, wrap a two-inch elastic compression bandage around it. Put several wraps around the big toe and then include the rest of the forefoot within the bandage. This will limit swelling of your big toe. Other toes cannot be effectively compressed with a bandage. It is important not to cut off blood circulation to your toe or any body part when using such wraps – do not make them very tight. Elevation — Keep the injured foot raised above the level of your heart for 48 hours (such as up on a pillow). This will help drain fluid and reduce swelling. Protection — Wear a shoe with a stiff sole to help protect the injured toe. Also available are topical pain medicines (eg, creams, patches) that are applied to the skin. Often toe sprains cannot be prevented. However, to reduce your risk of getting a sprained toe, wear stiff-soled athletic shoes when playing sports. 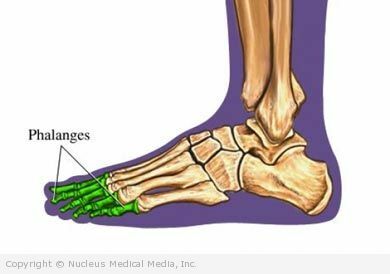 Proper treatment of toe sprains can help prevent long-term complications or problems with the toe joint such as misalignment and immobility.